What’s it about? Tanjiro Kamado is living a peaceful life in the mountains, providing for his mother and siblings by selling charcoal in the nearby village. One morning, he returns from peddling his wares to find his whole family dead, with an unfamiliar scent lingering over the bloody scene. His sister Nezuko appears to be the only survivor… but when he’s carrying her to safety, she viciously attacks! I’m calling it now: Demon Slayer: Kimetsu no Yaiba is going to be this season’s big hit. After all, it’s a Shonen JUMP title with animation by the renowned studio ufotable, best known for its adaptations of the Fate franchise. With a distinctive art style lifted from the original manga, it’s a gorgeous hack-and-slash with the hard-hitting action that mainstream anime fandom craves. It’s tailor-made to appeal to a huge variety of fans. But AniFem’s staff and readers don’t always see eye-to-eye with anime’s biggest mainstream hits. So what does Demon Slayer have to offer to us? I’ve seen more shounen anime than I can count, and Demon Slayer does manage to make itself stand out with its character writing. Tanjiro is a sweet-natured boy who wants nothing more than to live a peaceful life with his family. He doesn’t crave power or glory like most of his fellow protagonists; his primary motivation is to get Nezuko back to her old self. There’s a certain appeal to the unwilling hero, especially in combat-driven series like this one. In fact, compassion seems to be a major driving force for most of the characters introduced in this first episode. When Giyuu, a demon slayer, finds Tanjiro and Nezuko, he scolds Tanjiro for being soft and putting his own life at risk. 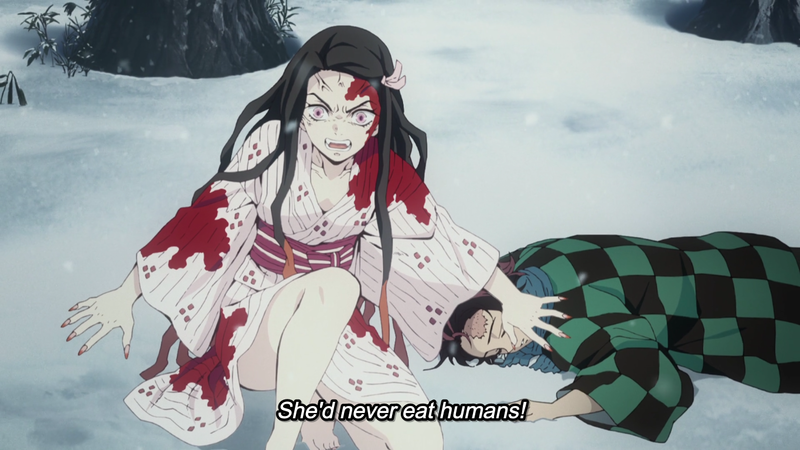 Demons (oni) are vicious and brutal; Nezuko is his sister in physical form only, and Tanjiro has been leaving himself vulnerable at every turn. But his internal monologue reveals just how much empathy he feels toward the younger boy, even if he can’t show it in the moment. He understands how much pain Tanjiro is in, having his sister try to viciously devour him right after losing the rest of their family. Giyuu taking that moment to acknowledge the incredible sadness that Tanjiro must be facing is what set this episode apart from similar series for me. We as the viewers may be invited to sympathize with the protagonist, but rarely do other characters stop and express it on their own. It’s a sign of an emotionally intelligent core, that Demon Slayer plans to include characters who genuinely care about and care for one another. But what of Nezuko, our main female character? That’s a bit harder to say. Her saving grace is that she’s retained some of her old self and willingly protects Tanjiro, rather than messily devouring him, unlike what most demons would do. She certainly has physical power to spare and will be a potent fighter. Her feral nature also makes her less… docile than shounen heroines tend to be. She’s not there to be a cheerleader, healer, or sidekick. She’s a dangerous wild beast, beautiful but deadly. Whether that works will depend pretty heavily on how the rest of the series goes and what the rest of the cast is like. Will there be female demon slayers who can show that women don’t have to be possessed by demons to be ferocious? Will Nezuko be a true character or effectively an object, a weapon that must be subjugated and controlled when not in use? Even if it doesn’t break new ground with its female characters, Demon Slayer: Kimetsu no Yaiba will undoubtedly be a fun, action-packed ride and look great while doing so. I’m looking forward to spending more time with it.